. : New in Spring :: Ski XCOttawa.ca :: Skiing in Ottawa and Gatineau Park :. I love spring. The days get longer; the days get warmer and it always seems like a good vantage point from which to look at your ski season. I tend post nationals to review the season, look at goals for the next season and then promptly forget both until mid May. This gives me a good mental beak. Every spring I try to do something new to divert my mind from skiing. It usually vaguely involves sport because that is what I am interested in. In the twelfth grade I joined the soccer team. This was a blast; it was the first year our school had a girls team and we showed the boys up by coming in fourth at OFFSA. In first year I started yoga. This was fun and although I am far from a yoga buff I do continue to go from time to time and picked up some beneficial tips from it on stretching. Second year university I took up swimming. I have kept this up. I had quit swimming lessons in the 6th grade so when I started I was in the slow lane and had to rest every 25 meters. With slow determination I built up my stamina and through university I swam 1-3 times a week. I like swimming for several reasons. First, in the fall and winter it is an activity you can do in the city after dark when it is awkward to get to a ski place or is rainy and cold out. It also it is a type of training that does not have as much impact on your joints so you can add in on top of a hard week. Third year, I tried mountain biking. I kept this up sporadically. Last year I moved to Ottawa and got a “real” job. This although not a “training” change was a bit of a life change. (By the way Ottawa folk, I do love it here). This Spring I was a bit stumped as to what to do so I decided to not do something instead...You see every year, in addition to trying something new, as soon as the snow leaves I hop on my roller skis and off I go for the summer. There are a few reasons why I do this. First, I love roller skiing; second, I have had several injuries in the past that have meant I can’t run as much as I used to and I am also indifferent to biking. In order to take a break from roller skiing I decided to fill some hours up by hitting the gym. I have been notoriously bad for going to the gym but I have actually been enjoying it. I also finally got my bike properly fitted at Fresh Air. It has made a huge difference and I am actually comfortable on my bike now and have been biking a ton (by my standards anyways). I have also filled up a good deal of time running which I have always loved. I also hit the pool from time to time. After refraining all spring I started back roller skiing in June and I am enjoying it again and am happy I took a good break from it. This picture has nothing to do with this article but does show my obsession with roller skiing. 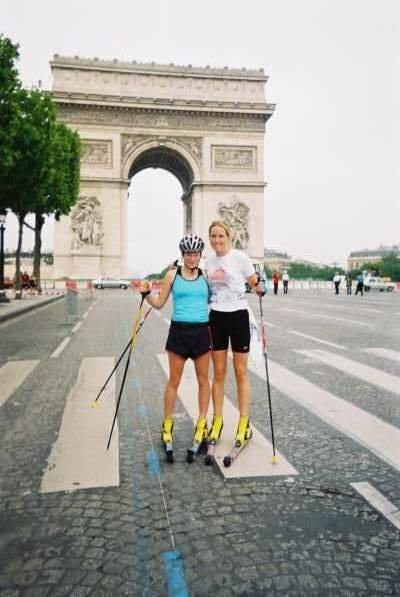 I dragged my roller ski’s all through Europe in 2004! Here I am on the Champs-Élysées in Paris before the Tour de France. Travel-Tourism: Snow WebCams: Let the Snow Watch Begin! Ski Gear: Make Your Own Ski Boots? Ski Gear: Thank You Karhu Skis!